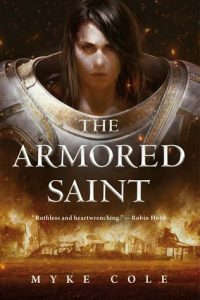 I didn’t know I wanted to read a strong character-driven fantasy that felt like a mecha Joan of Arc until I picked up Myke Cole’s The Armored Saint. 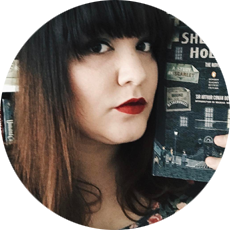 I feel like I’ve said it a million times before, but it’s worth repeating — tor.com puts out the most amazing, entertaining novellas, and I’ve devoured each and every one I’ve gotten my hands on. In the short 206 pages that starts a trilogy, Myke Cole packs a punch of a story, crafts a detailed and dedicated character journey that absolutely feels as if you’re immersing yourself in a story that could easily fill up hundreds more pages. By the time I was a third of the way through, I was completely emotionally invested in Heloise. How many feelings can I feel in 200 pages? A LOT, THANKS. Myke Cole’s skill at writing vivid, heart-stopping action scenes intermixed with the real, heart-felt emotional development and growth of Heloise is some of the strongest I’ve seen in coming-of-age fantasy in a long time. I love novels set in that feudal kingdom sort of world in which there’s an oppressive monarchy and/or religious order, and Heloise being a young woman who does not ascribe to the rigid morals of the Order in a medieval-esque kingdom so reminds me of the common myth of Joan of Arc that a lot of us are familiar with. And I LOVE IT. I can’t wait for the sequels, and I can’t wait to see where Heloise goes and what devious trouble the Order contrives next. If you like grimdark fantasy, coming-of-age stories, and straight up fabulous entertainment, check this one out!